The top court in Guatemala overturned the genocide conviction of Efrain Rios Montt the former dictator of Guatemala. The court ordered the trial to begin again in the middle of its proceedings. The ruling on Monday threw the process into disarray just 10 days after the trial was hailed as historic for the first guilty verdict for the act of genocide against any former leader in Latin America. Martin Guzman, the secretary of the Constitutional Court said the trial must return to where it was as of April 19 to solve a number of issues that were on appeal. The Constitutional Court’s ruling came just 10 days after a panel of three judges convicted Rios Montt, the 86-year-old retired general of crimes against humanity and genocide. The panel declared Rios Montt guilty after two months of testimony, saying he was aware that more than 1770 Ixil Mayans had been slaughtered in the country’s western highlands, but did not do anything to stop it. Rios Montt was sentenced to 80 years, which drew cheers from the many people who had been packed into the courtroom to hear the verdict. Immediately, the lawyers for Rios Montt appealed the conviction. 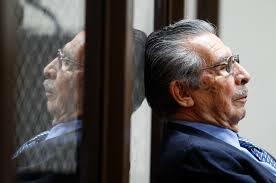 Rios Montt was in a military prison for three days and then moved to a military hospital due to health complications. He remains there but his lawyer will seek his release on Tuesday. No one who represents the victims or their families was available for comment following the reversal of the conviction. No date has been set as to when the trail would resume.